Where Are the Retail Investors ? With the historic and surprising bearish AAII sentiment, I wondered about the “sheeple” index that I mentioned about a year ago. This proprietary index of mine looks at the retail brokers web traffic and uses it as a measure of retail investor participation in the market. 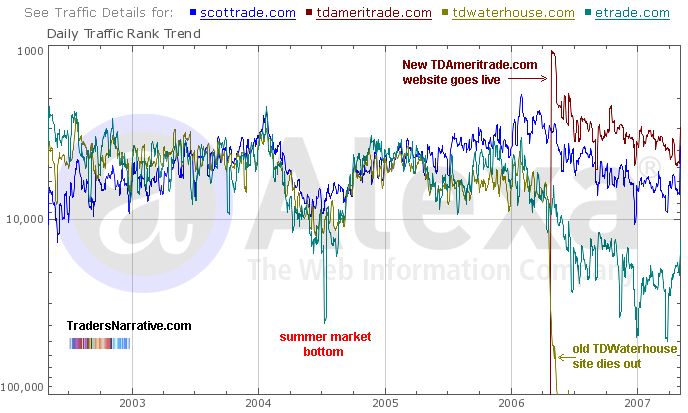 I look at the three most popular online brokers: ScotTrade, E-Trade (ETFC) and TD Ameritrade (AMTD). I ignore the more trader oriented brokers like Interactive Brokers (IBKR) and CyberTrader (SCHW) because I’m trying to only measure the activity of Mom’n'Pop investors who are casual in their market participation. I want to track only those who are less knowledgeable about the market and more apt to get swept up in the vicissitudes of the market, swinging from euphoria to despair and back again. 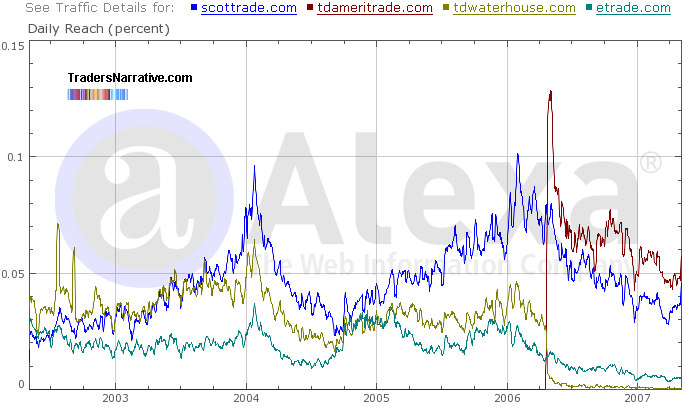 The graph shows the merger of TD Waterhouse (red line) with Ameritrade (yellow line) so the spike up you see is the new website coming online, replacing the old one. Anyway, in the graph you can see that the traffic for the different online brokers not only ebbs and flows as a group, it does an impressive job of reflecting the moods of the average retail investor out there. For example, notice how in the summer of 2004 the traffic hits a low just as the market was forming an intermediate bottom. The retail investor has definitely been sitting this one out. Since early 2006, even as the market has powered ahead, less and less people have logged on to their online accounts to participate. Interestingly, the most recent results for May are showing a dramatic uptick - but is it short-term noise or are the retail investors and traders beginning to enter the market? The Alexa numbers are very erratic and this could very well be just a blip. Only time will tell. All we can say now is that it confirms the lack of love towards the market by the casual investor and trader. Which means that the market participants are for the most part commercials, institutions and professional traders battling it out. Even more surprising, analyst buy recommendations are at a 10 year low for US stocks. This, eventhough we are seeing a powerful showing of earnings on Wall Street. Which is, in turn, helping to give this market a reasonable price/earnings ratio. And finally, according to Commitment of Traders the small speculators are positioned short right now. is this a last desperate attempt to make money befoe we hit the ice berg? not sure what you mean by “uptick in investment”?